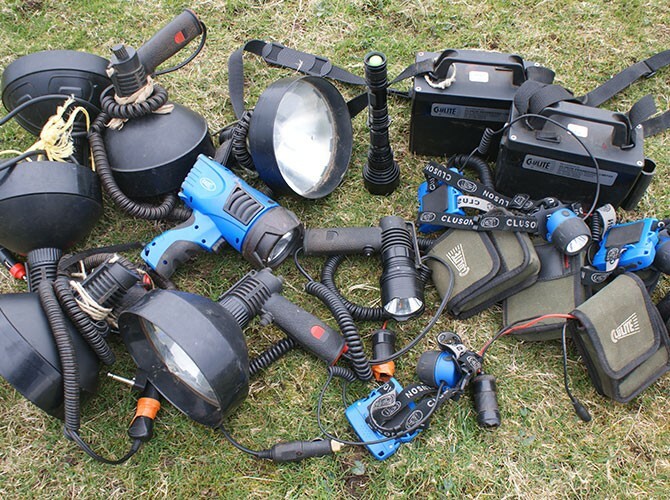 At Evergreen rabbit control we employ a wide range of extremely effective methods of rabbit control involving the use of high powered lamps. What is Lamping for Rabbits? Lamping rabbits is a method of control that involves an operative to shine a high powered light across an area. The area is systematically checked until any rabbits are illuminated. This then allows us to effectively and quickly remove rabbits via a variety of control measures. These are tailored to suit each variation of circumstances we encounter. This can be via shooting, with an especially trained dog or bird of prey. This control method can be carried out on foot, from a 4×4 or a ATV depending on the clients request or suitability. At Evergreen rabbit control we use sound moderated shotguns from quad bikes to shoot rabbits on open areas such as farmland, airfields, large sports grounds. Far less disturbance of both people and the quarry species. The damage to ground surfaces is negligible and places that are difficult to access with larger vehicles are brought to within our control area. All of the above are far more customer friendly than the more traditional method of driving a 4×4 and using an extremely loud 12 bore shot gun. 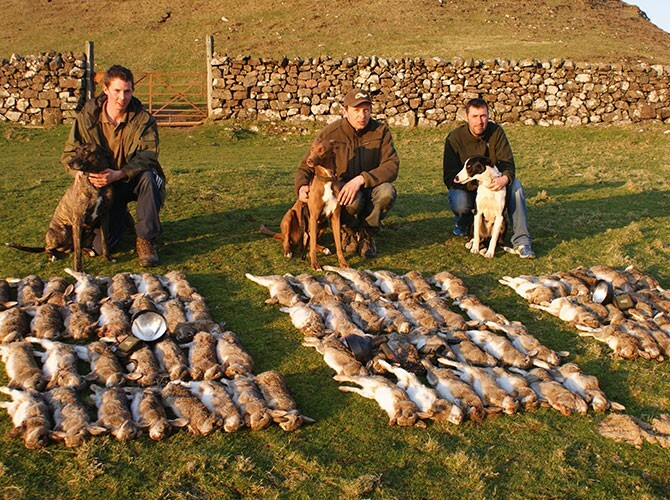 On many occasions our staff, using the above method have been able to cull many hundreds of rabbits in a night, something unobtainable under the old systems. 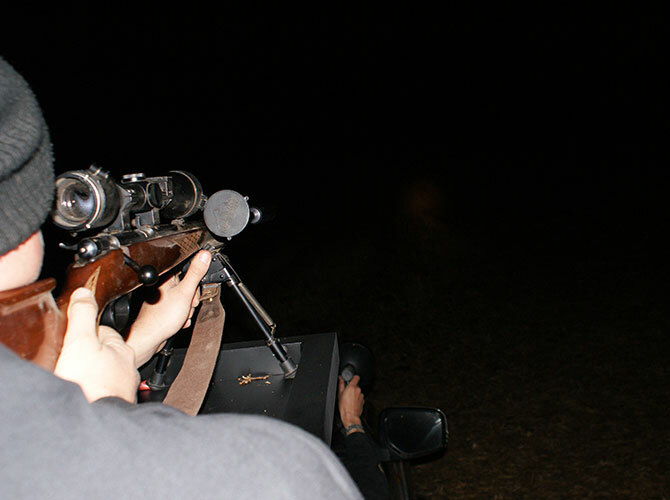 Our record number rabbits removed during a 6 ½ hour night was 521 with just one person shooting. You can read more here. We have a wide range of weapons available at Evergreen Rabbit Control and we tailor their use to the various areas we are working on. On large open spaces such as estates and farmland we normally opt for either .17 or .22 rim fire rifles. These weapons are highly effective at ranges up to 200 yards and can be used in a variety of ways, such as from quad bikes, 4x4s or on foot, depending on the area. Around buildings, gardens and restricted areas air rifles are employed, silent and deadly at close range they are ideal where noise is to be kept to a minimum. All weapons are held under legal requirements and are serviced and maintained to the highest standard. All rifles are fitted with high quality telescopic sights as well as sound moderators. All staff are thoroughly trained in safety and marksmanship. All our staff have full open firearm and shotgun licences. When a rabbit control problem arises where the use of guns of any type is impracticable the use of lurchers (specially bred and trained running dogs) is the solution. When employing this method to deal with problem rabbits, one or two dogs are used whilst the operative is on foot. The rabbit is illuminated with the spotlight; the dog is slipped from its collar and within moment’s returns with the rabbit unharmed to be humanely dispatched. We utilised this method during “The Isle of Canna Rabbit Cull” with great effect. We use our own strain of lurcher for this purpose. In the same way as we employ dogs at Evergreen Rabbit Control, hawks are also used in conjunction with the lamp. This effective and unique method is also conducted on foot; the hawk riding on the handler’s fist till the rabbit is illuminated in the beam of light. Once this occurs, the bird is “cast” (sent off) to swiftly intercept and capture its prey. The area we are working is then systematically covered until as many rabbits as possible have been taken. This method is a very useful form of control when rabbit control is needed to be carried out at night when firearms are not safe. When should you use Lamping for Rabbit Control? Lamping rabbits at night is a form of control that can be suited to almost any situation or location. It can be used to reduce the general population quickly over a large area or to get the last few in a smaller site. This method can also be used as part of regular visit schedule to ensure a rabbit population doesn’t get the chance to increase. Why you need a professional for Lamping Rabbit Control. Lamping in all its forms, allows us at Evergreen Rabbit Control to offer a highly specialised service that we believe to be second to none. Used together with the other methods we employ we can deal with, and successfully handle all rabbit problems that occur. We work closely with the police and inform them of each lamping operation.